Rayleigh theory tells us everything we need to know about scattering from the gas making up an atmosphere, but to deal with cloud and aerosol particles, we need to know about scattering from objects that are not small compared to a wavelength, and indeed could be considerably larger than a wavelength, as is the case for visible light scattering from water or ice clouds on Earth. The answer is provided by Mie theory 2, which is a general solution for scattering of an electromagnetic wave from a spherical particle having uniform complex index of refraction. 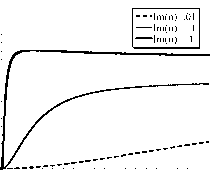 Mie theory reduces to Rayleigh theory in the limit of small non-absorbing particles. Ice crystals and dust particles are not spherical, and while numerical solutions are available for complex particles,for our purposes it will prove adequate to treat such cases in terms of equivalent spheres. 2The theory is named for Gustav Mie (1869-1957), who published the solution in 1908, while he was a professor at Greifswald University in Germany. Figure 5.5: Scattering efficiency (left panel) and asymmetry factor (right panel) for Mie scattering from a non-absorbing sphere. The index of refraction of the medium is unity. r is the radius of the particle, and A is the wavelength of the incident light measured in the same units as r.
an infinite sum over spherical Bessel functions, and is a real tour-de-force of early 20th century applied mathematics. The formula is very convenient for evaluation of scattering parameters on a computer, but it is too complicated to yield any insight as to the nature of the solution. For that reason, we do not bother to reproduce the formula here; it is derived and discussed in the references section for this chapter, and a routine for evaluating the Mie solution is provided as part of the software supplement. Here we will only present some key results needed to provide a basis for cloud and aerosol scattering in the solar spectrum and infrared. Let no, assumed real, be the index of refraction of the medium in which the particle is suspended. Define the Mie parameter r = nor/A, where r is the particle radius and A is the wavelength of the incident light in vacuum, measured in the same units as r. The relative index of refraction is nrei = n/no, where n is the index of refraction of the substance making up the particle. The main things we wish to compute from the Mie solution are the phase function, the scattering efficiency, the absorption efficiency, and the asymmetry factor. These are all non-dimensional quantities, and depend only on r and nrel. Let's first take a look at some scattering properties in the conservative case, nj = 0. In this case, Qabs = 0. Fig. 5.5 shows the scattering efficiency and asymmetry factor as a function of r/A for several different values of the real index of refraction of the scatterer. 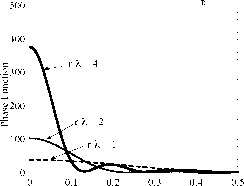 Since 1/A is the wavenumber, the graph can be thought of as displaying the scattering properties for increasing particle size with fixed wavenumber, or for increasing wavenumber with fixed particle size. Note that in the limit nR ^ 1 there should be no scattering at all, since in that case the particle is not optically distinct from the surrounding medium. For any given nR, the scattering efficiency becomes small when r/A is sufficiently small; this is the Rayleigh limit. The scattering efficiency reaches its first peak at an order unity value of r/A, and the position of the first peak gets closer to zero as nR — 1 is made larger and the particle is made more refractive. In this sense, for a given size and wavelength, particles made of more refractive substances like CO2 ice or concentrated H2SO4 act like smaller particles than particles made of less refractive substances like water or liquid CH4. 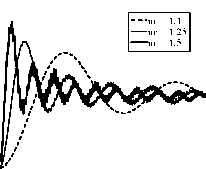 The first peak represents the optimal conditions for scattering. At the first peak, the scattering cross section can be 4 times or more the actual cross-section area of the particle. As r/A is increased past the first peak, the scattering efficiency oscillates between values somewhat below 2 to somewhat above 2 through a number of oscillations of decreasing amplitude, asymptoting at a value of 2 when the particle is large compared to the wavelength. The limit of large r/A is the geometric optics limit, familiar from schoolbook depictions of how lenses work. In the geometrics optic limit, a beam of light is represented as a bundle of independent parallel rays, each of which travels in a straight line unless deflected from its course by an encounter with the interface between the particle and the medium - once upon entering the particle, and once upon leaving it. It is surprising that, in this limit, the scattering efficiency should asymptote to 2, since one would be quite reasonable in thinking that rays that do not encounter the object would be unaffected, implying Qsca = 1. What is missing from the geometric optics picture is diffraction. Light is indeed a wave, and this has consequences that cannot be captured by the ray-tracing on which geometric optics is based. The light encountering the sphere is a plane electromagnetic wave, and the scattering takes a circular chunk out of it; a wave with a "hole" in it is simply not a solution to Maxwell's equations, and as one proceeds past the obstacle the hole fills in with parts of the beam that never directly encountered the obstacle. It is the diversion of this part of the incident beam that accounts for the "extra" scattering cross section. The nature of diffraction is far more easily understood through examination of some elementary solutions to Maxwell's equations than it is through this rather cryptic explanation, and the reader in pursuit of deeper understanding is encouraged to study the treatment in the textbooks listed in the references to this chapter. The main thing to take away from the preceding discussion is that refractive particles made of common cloud-forming substances become very good scatterers when their radius is comparable to or exceeds the wavelength of the light being scattered. The scattering cross section is two or more times the cross section area, and for particles whose radius is more than a few times the wavelength, the scattering efficiency is close to 2, more or less independent of what the particle is made of, and more or less independent of wavelength. This limit applies to visible light scattering off of typical cloud droplets, which have radii of 5 to 10 ^m. For infrared light scattering off of cloud particles (e.g. methane clouds on Titan or dry-ice clouds on Early Mars), or for visible light scattering from micrometer-sized aerosol particles, the wavelength is comparable to the particle size, and one needs to take both wavelength and index of refraction into account in order to see how much the scattering efficiency is enhanced over the geometric-optic limit. Turning to the right-hand panel of Figure 5.5, we see that the scattering becomes symmetric for particles small compared to a wavelength, but becomes extremely forward-peaked for particles of radius comparable to or larger than a wavelength. For nR = 1.25, somewhat smaller than the value for water, the asymmetry factor is on the order of .85 for large particles. The reason for the strong forward bias is that the large particles are rather like spherical lenses, and can bend light somewhat from the oncoming path, but cannot easily reflect it into the backward direction. This feature of scattering is very important in the treatment of cloud effects on the radiation budget. The forward bias in scattering reduces the effectiveness of clouds as scatterers, and reduces their albedos well below what one would have for layers of symmetric scatterers having the same optical thickness. Without the forward scattering bias, clouds would be much more reflective of solar radiation, and planets would be much colder. Figure 5.6: Scattering efficiency (left panel) and asymmetry factor (right panel) for Mie scattering from a non-absorbing sphere. The index of refraction of the medium is unity. r is the radius of the particle, and A is the wavelength of the incident light measured in the same units as r.
original direction. Multiple scattering in this case allows a considerable amount of light to be back-scattered relative to its original direction, though it can take several bounces before the light turns the corner. This effect allows carbon dioxide ice clouds composed of particles of size comparable to an infrared wavelength to be quite good reflectors of infrared light trying to escape to space. Visible light scattering from such clouds is much more forward-peaked, and correspondingly less efficient. Figure 5.7: Scattering efficiency (left panel) and absorption efficiency (right panel) for Mie scattering from a partially absorbing sphere. The real part of the index of refraction is held fixed at unity while the imaginary part is varied as indicated for each curve in the figure. Other parameters are defined as in Fig. 5.5.
on the albedo of a planet! Now we'll turn our attention to absorbing particles. Figure 5.7 shows the scattering and absorption efficiencies for particles with nR = 1 having various nonzero values if n/. 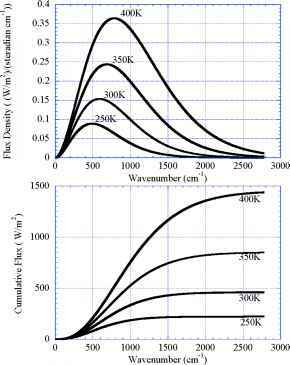 For n/ = .1 and n/ = .01 the absorption efficiency increases monotonically with particle size, and approaches unity from below (for the latter of these cases, the absorption efficiency is .89 at r/A = 100 and .997 at r/A = 500, outside the range plotted in the graph). This is typical behavior for particles with n/ appreciably less than unity, for which the light takes several wavelengths to decay upon encountering the particle. Larger particles absorb more simply because the light travels a longer distance within the particle, and has more opportunity to decay. For similar reasons, when n/ is made smaller, the particle must be made larger in order for there to be appreciable decay. In any event, when the particle is made large enough, it essentially absorbs a portion of the incident beam with area equal to the cross section area of the particle. Perhaps more surprisingly, though, the scattering efficiency also rises with particle size - absorbing particle don't just absorb; they also deflect light from the incident direction. This is due to the same diffraction phenomenon we encountered previously. Taking a disk out of the incident beam inevitably causes the remaining part of the beam to be deflected from its original path. For large particles the scattering efficiency and absorption efficiency sum to 2, with half the intercepted beam being absorbed and the other half scattered. When the particles are very strongly absorbing the behavior is somewhat different,as typified by the curve for n/ = 1 in Fig. 5.7. In this case the absorption efficiency actually overshoots unity for particles somewhat smaller than a wavelength. The particle is able to sweep up and absorb radiation from an area larger than its cross-section, owing to the distortion of the electromagnetic field caused by the particle itself. On the other hand, as the particle is made larger, the absorption efficiency goes down and asymptotes to a value somewhat less than unity, because the incident wave is not able to penetrate deeply into the particle, and instead skirts along near its surface. In compensation, the scattering efficiency for large particles becomes greater than unity. The above results were for particles with nR = 1, in which case there is neither scattering nor absorption when n/ approaches zero. The behavior for nR > 1 is explored in Problem ??. When nR > 1 then the scattering cross section behavior resembles the conservative case when n/ is small, but even a small n/ damps out the ripples in qsca(r) for sufficiently large particles. The asymptotic value of qabs is still close to unity for sufficiently large particles throughout the range of n/, but the overshoot properties differ somewhat from the case n/ = 1. As a rule of thumb, then, we can say that when particles become larger than the characteristic decay length A/2nn/, they absorb essentially everything within a disk of area equal to the cross section area of the particle. The absorption efficiency is somewhat reduced for particles with n/ > .1, but even for n/ = 1, which is the largest value likely to be encountered, the reduction in efficiency is rather modest. Liquid water has n/ > .1 throughout the infrared, so any liquid water cloud droplet larger than about 10 ^m in radius will absorb nearly all the infrared it encounters. In fact, for liquid water n/ « 1 throughout most of the infrared, so that even quite small particles are efficient absorbers. Water ice can have n/ as low as .05 in some parts of the infrared spectrum, so the particles need to be twice as large to be equally good absorbers in that part of the spectrum, but ice clouds observed on Earth do tend to have larger particle sizes than water clouds.